This week's homepage article is brought to you by the wonderful staff and volunteers of the State Library of South Australia. They have spent the last few years digitising the significant South Australian Red Cross Information Bureau collection, which the bureau donated to the library in 1919. Their tireless work has uncovered many fascinating and poignant stories. With this article they would like to share with you the story of the Potter brothers. 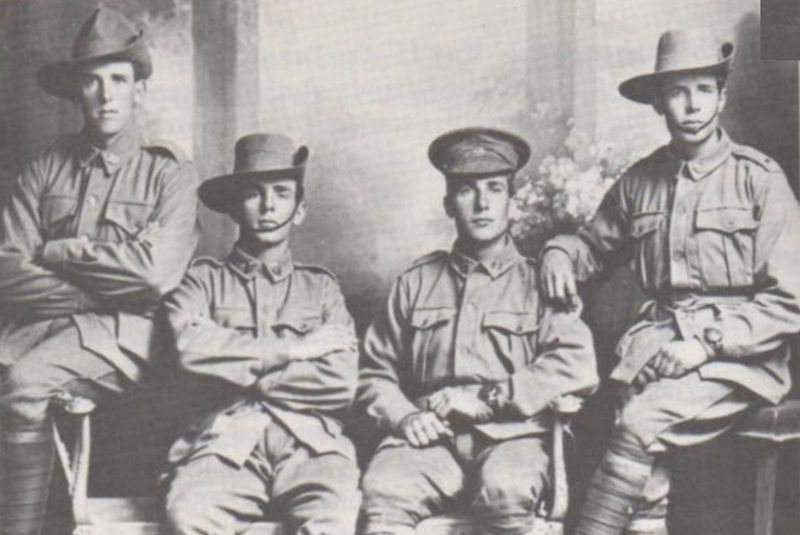 Ralph Victor Potter’s World War One experience spanned just two years, but during this time the young South Australian saw and experienced the worst of the conflict. Ralph enlisted on 27 July 1915 at the age of 23 years, the first of four brothers from his family to do so. His brothers enlisted a few months later – Thomas James Albert on 15 September and Edward Wilfred and Hurtle Francis Constable on 21 September. All four brothers joined the 12th Battalion and were given consecutive service numbers 3738 (EW), 3739 (TJA), 3740 (HFC) and 3741 (RV). Together, the brothers embarked for Egypt from Adelaide on the RMS Malwa on 2 December 1915. March 1916 saw a reorganisation of the AIF known as the ‘doubling’ of the AIF. As a result the Potter brothers were transferred to the newly raised 52nd Battalion and then proceeded to the Western Front. The Battalion arrived in France at the beginning of June 1916 and had its first major engagement at Mouquet Farm on 3 September 1916. The 52nd suffered heavy casualties, losing 50% of its fighting strength. Edward was reported killed in action and Thomas and Hurtle were reported missing in action. Yours to hand safely, but have nothing to report, as a moments thought would have told you I sent all news available home. No doubt if you apply to a Military enquiry office, you will get a prisoners list from Germany. Thanking you for expression of sympathy and kindness in making enquiries. In July 1917, it must have been made plain to Ralph that those at home did not know the details of what had happened to his brothers. The horror Ralph and his brothers had endured is apparent in the statements Ralph gave about his brothers’ fates. He was seen walking back to the dressing station, but never reached it. Feel quite sure he was killed that morning. I saw him killed at Mouquet Farm shot through the head, death instantaneous. I was beside him when he fell down, he never moved. I found letters and proof of his identification in his gas helmet alongside of his decomposed body at Moquet [sic] Farm March 25th 1917. The bodies were being gathered at that time. No doubt his remains would be buried. Ralph returned to Australia on the hospital ship Benalla which sailed August 1917 and arrived in Melbourne on 24 October 1917. His mother Eliza died on 20 December 1917 and his father Benjamin then lived with Ralph at Wilmington, South Australia. Ralph married Grace Turner Wright (daughter of William Jabez Wright) on 17 March 1926 at the Methodist Church, Quorn. He died in Howard, Queensland, on 21 May 1961, aged 68 years.